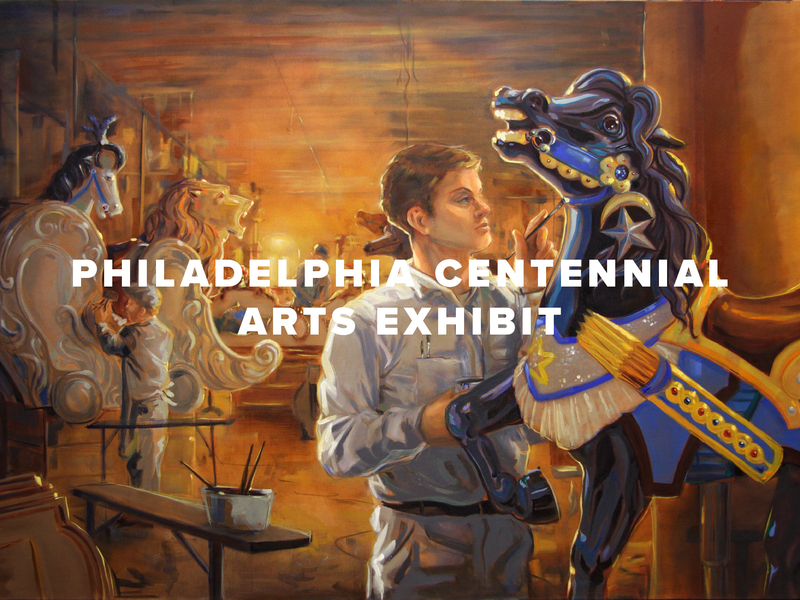 Pond Lehocky Stern and Giordano is proud to sponsor the Centennial Arts Project, which commissioned eight large-scale oil paintings by a local artist that are displayed prominently in Philadelphia's Workers' Compensation hearing office. The paintings honor Philadelphia's rich manufacturing history and educate the public about the role of labor and industry in the city. Every day, injured workers, attorneys, witnesses, staff and judges convene at the Workers' Compensation Office of Adjudication at 8th and Arch Street in Philadelphia to air and resolve disputes. The whole process can be stressful, leaving the participants anxious, tense and even angry. It is the perfect place for some beauty celebrating the contributions of Philadelphia's workers and manufacturers. The brainchild of Workers' Compensation Judge Scott Olin, the project commemorates the centennial of Pennsylvania's Workers' Compensation Act, which passed the Pennsylvania Legislature on June 2, 1915. The aim of the project was to promote respect for the workers and innovators of the past, admiration for their achievements and pride in the city's industrial heritage. In anticipation of the centennial, the Philadelphia Bar Association's Workers' Compensation Section established the 10-member Arts in the Court Committee, composed of local attorneys and judges. Pond Lehocky Associate Alexis Handrich served on the committee, which was responsible for finding the artist, choosing the paintings' topics, approving the sketches and getting sponsorships. Judge Olin took a lead role by arranging for the framing, display, preservation, appraisal and insuring of the artwork. The committee selected local artist Shaina Anderson, who at the time was a student at Philadelphia's University of the Arts. She is now a freelance artist and illustrator living in Pittsburgh. Law firms throughout the city sponsored each painting. Meanwhile, the Pond Lehocky Stern Giordano Preservation Fund was established to conserve and maintain the paintings, ensuring they enlighten and delight generations of visitors to the Philadelphia hearing office. Aella Diamantopolous will serve as the chief conservator. The first painting, "Philadelphia Moves the Nation," was unveiled in 2010. It depicts metal fabricator Budd Company's plant on Red Lion Road, which manufactured passenger rail cars. Another painting was unveiled in 2010, with subsequent paintings released each year through 2016. Lubin Manufacturing Co., one of the earliest motion picture production studios. An explanatory panel posted with the artwork says the paintings "show glimpses of how Philadelphians lived, traveled, worked, ate and entertained themselves." They show what makes "Philadelphia unique and different from American cities of yesterday, as well as today" and "help put our own lives in perspective." Pond Lehocky's participation is another example of the firm's push to engage with the community. The artwork's theme of promoting the appreciation of Philadelphia's work history is particularly in tune with the Firm's mission of servicing workers. The Firm hopes the paintings not only teach visitors about the city's industrial roots but also create awareness about the value of work today. Founded by Samuel Pond, Jerry Lehocky, David Stern and Thomas Giordano Jr. in July 2010 with six attorneys and only 22 total staff members, the firm has expanded its practice areas to include employment law in addition to work injury and disability matters. Pond Lehocky has a successful nationwide network that allows clients to receive legal help anywhere in the nation. The firm’s attributes its success to its personalized, holistic client care and aggressive trial lawyer techniques.